I've heard of armchair analysis, but you're setting new grounds here Noah. Did no one ever tell Gazz it's wrong to hit girls? Did no one ever tell you to stop down-grading my boy Gazz? @Whispers_of_Sorrow Well, there is an age old mantra of not just standing there while a home-boy takes a backfist to the face, female or not. Whispers of sorrow, I thought that punching a friend down the street left that rule null and void. Noah might seem hinest, but he's a bit of a lier. I really hope Gaz has an iron-rich diet. Unless he secretly has pandemonium blood powers, he seems like he'd be pushing anemia every time he does anything. On a totally unrelated topic: Gazz is a blood mage, confirmed. 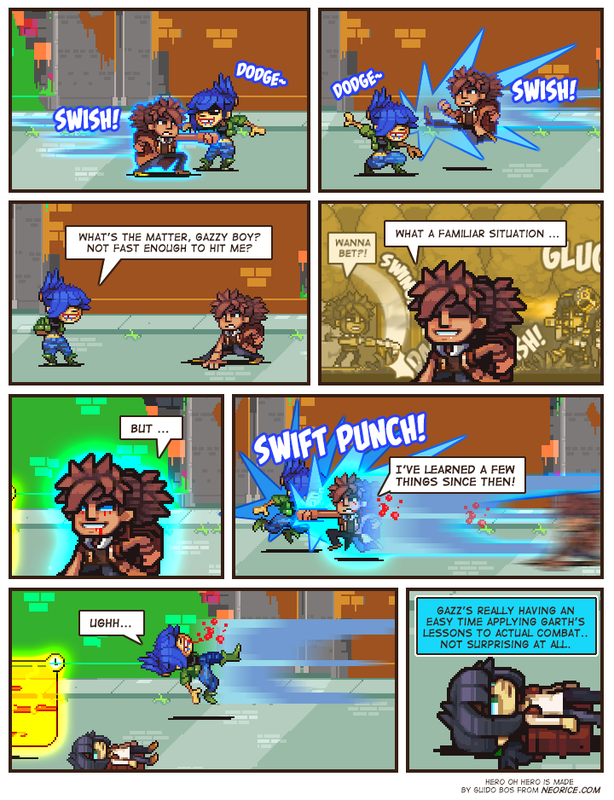 Bluenette is tricking Gazz into the amateur move of wasting his Spirit reserve. See, heâs bleeding already, after only half a dozen attacks. Gender equality. Besides, she started it. Gazz bleeding doesn't matter if he can make her bleed more. The page-commentary has reached a new low. I'm floored! I found Noah's position to be well grounded. The flat truth is that the under-lying ground-work of the theory he dug-up is down-to-earth and he shouldn't stand for your up-rising. Surely, Noah is recumbent on this issue. We don't know her gender. Maybe she identifies as a punchbag. It does seem like its a bit rough for Gaz's body when he kicks his spirit into overdrive. But all the same i have started to like him. Yes he actually seems to like this. And wants to be a leader. But he also tries to do it well. Encouraging the rest of his team, trusting their judgment and the like. I didn't spot the eye bleeding at first... it's actually worse this time, with the mouth bleeding as well. Gazz is trying to spring before he can walk, this can't end well. I think I've figured it out; Gaz can boost his own spirit magic by sacrificing some vitality.